The FLEXware 500 is for applications with medium power requirements such as homes, light commercial or larger backup power systems. 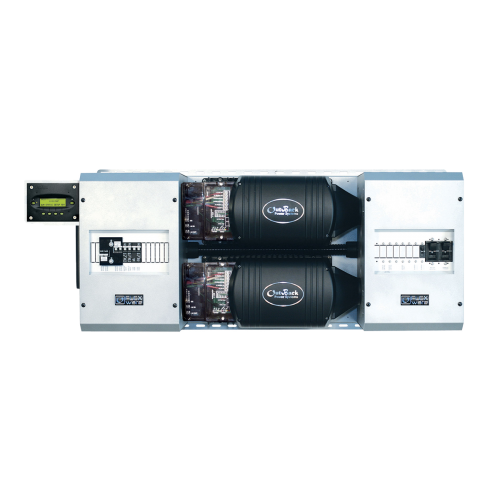 The FLEXware 500 system architecture can support up to two OutBack FX Series Inverter/Chargers, up to two OutBack charge controllers and all the associated AC and DC components. Due to a very compact design, FLEXware 500 AC and DC enclosures mount with a FLEXware MP in either a horizontal or vertical orientation to allow installation in more space-limited locations for a fast and professional looking wall-mounted installation. The FLEXware 500 accommodates all of the essential protective devices in two enclosures.